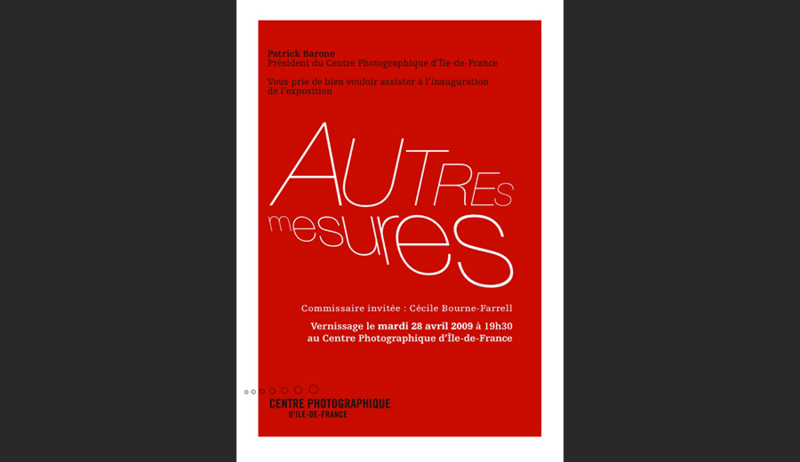 PILAR ALBARRACÍN, JULIETA ARANDA, SERGIO BELINCHÓN,HERMINE BOURGADIER, IRINA BOTEA, MICHEL BLAZY, DANIEL CHUST PETERS, LIONEL ESTÈVE, JEAN-FRANÇOIS FOURTOU, MICHEL FRANÇOIS, MIKLOS GAÁL, ISABELLE HAYEUR, DJAMEL KOKENE, SEAN LYNCH,ANTONI MIRALDA, JOACHIM MOGARRA, OTOBONG NKANGA, FLAVIE PINATEL, EDOUARD SAUTAI. The exhibition ‘Other measures’ gathers works of art, which are the result of diverse contemporary practices; their treatments alter our relationships to the notions of scale and proportion. Various means will be given, from maquette, in-situ collages, fixed-images to animation-film and also with a film programmation, in order to restore subjects of our imaginary contemporaries. This plurality of approaches is an invitation for playing to release formal constraints in a period where standard is the rule. The visitor will therefore be able to juxtapose and refer to other restitutions of scales from macro to nano. First of all, the notion of game (Flavie Pinatel) develops a sense of displacement of different use of space Daniel Chust Peters in architectural sites of a town or in a landscape to bridge different realities. The extraordinary is in contiguity with everyday life: here in a seemingly empty council estate we are witness to a frantic hide and seek chase of children. The utopic dimension of another social housing, the one of Cité Pierre Semard in Blanc-Mesnil is restored in the piece « Pièce détachée » of Edouard Sautai. Sean Lynch operates another displacement by putting a surveillance camera on the neck of a falcon that was trained to fly-over a specific social housing in Limerick, Ireland. The use of the surveillance camera could refer to objective photography : here it is interfering with the contingency of the fly-over of the rapacious bird, attesting connectivity in real time. More ludicrously are the flipbooks by Lionel Estève activated by the enormous thumb with the individual sounds of the three 16mm projectors, these demultiply the scale of the geometrical compositions realised in close relationship with the artist and a group of handicapped kids. Secondly, the notion of scale refers also to our capacity to go beyond one level of representation to another. Therefore, any archetypal conception proceeds from miniaturisation to gigantism, as proposed by Hermine Bourgadier, Michel François or Miklos Gaál’s works. Joachim Mogarra, elevated for exemple a monument to the artist Gina Pane within a real economy of means: a potato and a crown of thorns. Within the omnipresence of references, the artist Jean-François Fourtou is the master of the “House of giants”. 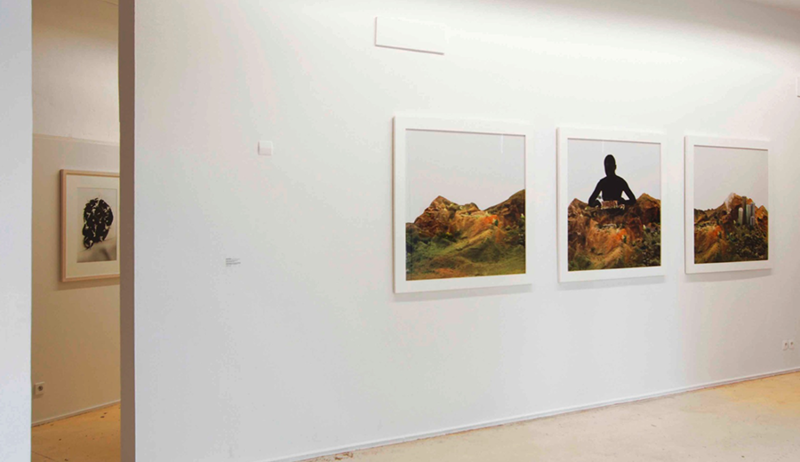 On the other hand, artists like Isabelle Hayeur, Sergio Belinchón and Otobong Nkanga are asking us to pay attention to the monstrous destruction of territories, be it on the sacred land of Indians from North America spoiled by residencies, or the Spanish littoral savagely urbanised by the impact of tourism in the landscape. Thirdly, out of scaleness yields to question the power of political representations. Certain artists like Miralda, Irina Botea or Julieta Aranda replay images produced around events like Vietnam War, or figures like Ceausescu, Mao or El Che. 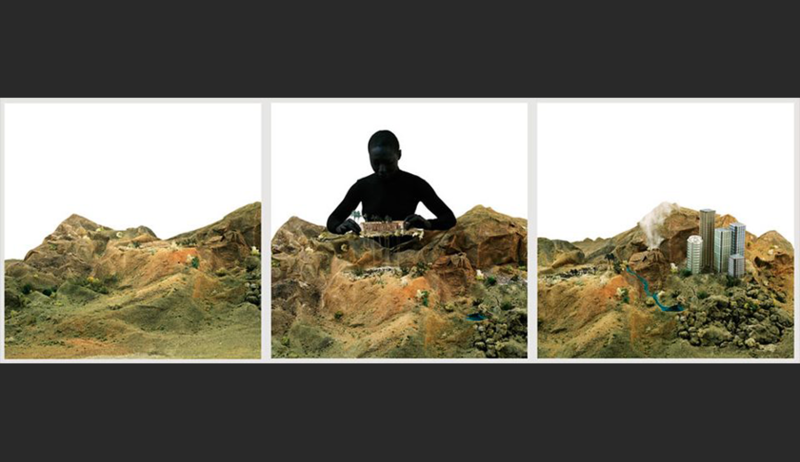 Pilar Albarracín realized a video-performance, which criticises the image of the woman reduced to folkloric codes. As it refers to Djamel Kokene, he proposes another relation by introducing a different scale to his outdoor piece realized on a wall in the town of Mouans en Sartoux, which is here reduced to a minuscule plasma screen. Finally, a lecture of the micro and the macro makes a particular sense in a moment where the increasing development of the nanotechnologies is one of the most important fields of fundamental contemporary research. In this perspective, the work of Michel Blazy locates itself at the limit of visibility as much a « moment of exception » as he speaks about them. Be it by looking at the stars or reverse by looking at the earth from space on, our vision is relative. It also matters from where one is and if our way of looking at the world opts for an exotopic or endotopic vision. Looking at the infinitely big or small requires a level of interpretation and refers to the idea that observing stars, a windmill or a minuscule insect remains astonishing. From that assertion, the question of the relationship between different scales imposes itself between things, the use of it and their contexts. The space of the [Centre of Photography Ile de France] will be during the time of the exhibition, the place of physical experiences and of different ways of putting in consideration this problematic at the centre of contemporary productions.